Join us in helping the world communicate better. Are you an aspiring Web Developer, who loves PHP Language? Then consider joining goFLUENT Philippines. We are looking for a talented Web Developer to help us create powerful, innovative and transformative websites, currently being visited by thousands of people from all over the world. You will join a team of passionate and driven individuals, and be part of a young, fast-paced and agile team. Experience developing large-scale, complex web applications and an appreciation for a pragmatic and well-tested code. American, Canadian or British citizens who are CURRENTLY LIVING in Mexico or other countries in Central America (We do not assist in processing visas for relocating) are welcome to apply. Fluency in other languages is a plus. Some college is required; degree is preferred. Computer skills are a must. Typing skills are necessary, including the ability to type accurately while on the telephone. Training/teaching experience is a plus. Webcam capability is a plus. As a Trainer, you will be conducting English training online, over the phone, and via webcam to our clients. Our learners are mostly business professionals and executives. On any given day, you may have a CEO, senior manager from a top company, scientist, doctor, lawyer, or other professionals from highly-specialized fields as your learner. Business or corporate experience is highly desired. 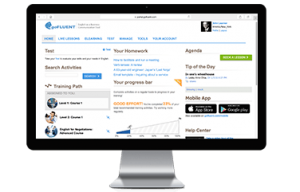 In the past 18 years, goFLUENT has become an expert in deploying relevant, engaging, efficient and seamless digital language learning experiences globally. goFLUENT aims to provide everyone an equal voice by giving everyone access to language improvement which builds confidence, empowers people’s careers and transforms lives. If you believe that everyone deserves the opportunity to conduct business and casual conversations with other language speakers without feeling inferior, join us on our mission! We look for employees who are smart, energetic, and driven to action and are willing to be based in our Eastwood office in Quezon City. We embrace Agile methodology and project management practices are deeply ingrained in the team’s work. This means that expertise, innovation, and accountability are important. Members are viewed as tech leaders and are responsible for communicating change and challenging the efficiency of our IT infrastructure. Project management practices are deeply ingrained in the team’s work. As a result, software engineers are encouraged to share opinions and provide other perspectives to discussions and developments. Diversity is valued in the team. You will meet hikers, marathoners, chefs, backpackers, and more who all share the same passion for coding. At goFLUENT, we face some of the most challenging and interesting problems in the language training industry. Every year, we train hundreds of thousands of learners anytime and anywhere. We use the latest technologies to offer our learners the best online learning experience through our desktop and mobile portals. As a Senior Software Engineer, you will be integrating and creating cutting-edge web-based learning solutions. If scale and complexity excite you, join our cool and dynamic environment! Armed with the latest technology, you will be bringing ideas to life. Your primary goal is to design and deliver best in class learning solutions in collaboration with our team of International Project Managers. You will raise the bar, in all things IT dev, from code development to code deployment. As the gatekeeper, you will ensure all elements of the system are in sync from data sources to databases. As an agent of change, the system under your care will be scalable, reliable, and sustainable – constantly surpassing competitors through new technologies. As the communicator and collaborator, you will make the complex, simple and the chaotic, orderly. As the creative technologist, you will transform problems to opportunities for innovation. Coding is a passion and not just a job. Fluent in the Java Language Universe, standard frameworks and tools. In the past 18 years, goFLUENT has become an expert in deploying relevant, engaging, efficient, and seamless digital language learning experiences globally. Our teams work following the microservices architecture. This means that expertise, innovation, and accountability are important. We embrace Agile methodology and project management practices are deeply ingrained in the team’s work. As a result, software engineers are encouraged to share opinions and provide other perspectives to discussions and developments. At goFLUENT we face some of the most challenging and interesting problems in the language training industry. Every year, we train hundreds of thousands of learners anytime and anywhere. We use the latest technologies to offer our learners the best online learning experience through our desktop and mobile portals. As an agent of change, the software interface under your care will be scalable, reliable, and sustainable – constantly surpassing competitors through new technologies. Thousands of global organizations use our products and solutions to boost their capabilities to use English as a Business Communication Tool. Request for your free trial today and discover why we’re one of the world’s most trusted Business English distance training companies with a 98% satisfaction. Fields with * are required. We value your privacy. Thousands of global organizations use our products and solutions to boost their capabilities to use English as a Business Communication Tool. View our eLearning demo and discover why we’re one of the world’s most trusted Business English distance training companies with a 98% satisfaction.